I have always found it interesting how I know of a lot of people that have been to Indonesia but none that have been to its mega city capital, Jakarta. It seems to have a bad rep but when I thought about it, I could not really think of many reasons why. It just seemed to be a place that people avoided. I wonder why even more now I have been! We spent 5 days exploring Jakarta on our most recent Indonesian adventure and I found I liked it a lot. As you would expect for such a large city, there are just so many fun things to do in Jakarta. We could have spent far longer, and we felt like we only scratched the surface. It is also a very easy city to visit and it feels quite adventurous as it was rare that we saw another Caucasian. In fact, I only remember seeing three in total! So if you are looking for somewhere different to visit, that’s well located to other interesting and popular places in Asia look no further – head to Jakarta! 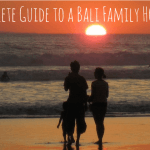 Below you will find our guide to what to do in Jakarta, where to stay in Jakarta, what to do in Jakarta with kids, how to get around Jakarta and other info you will want to know for a great visit! There are a crazy amount of places to visit in Jakarta especially because some of the options listed here could easily be visited for a few days each! 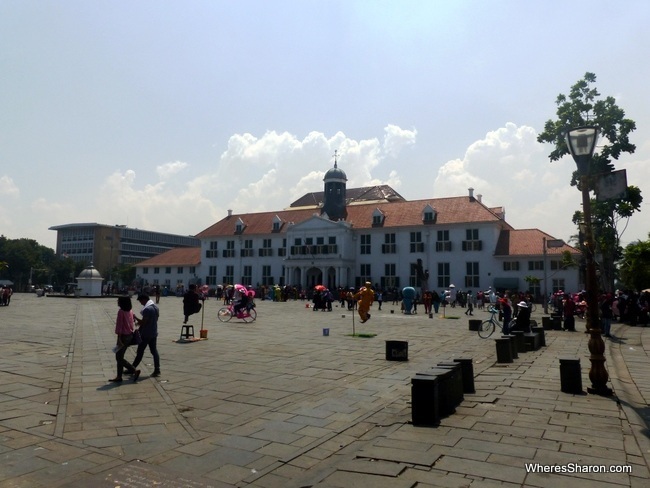 Kota is the historic heart of Jakarta where you can find the remains of the Dutch capital of Batavia. 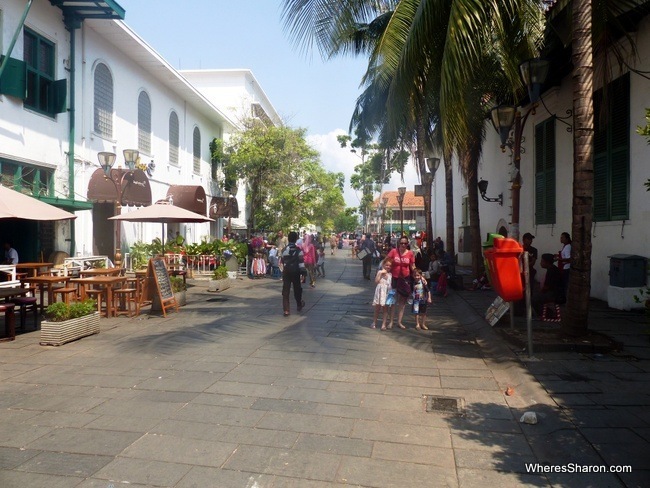 It has a very different feel to the rest of Jakarta that we visited with big colonial style buildings and cobblestones. 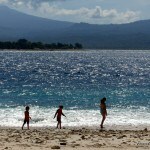 It’s a lovely place to explore when visiting Jakarta – the next four Jakarta attractions are all in this area. 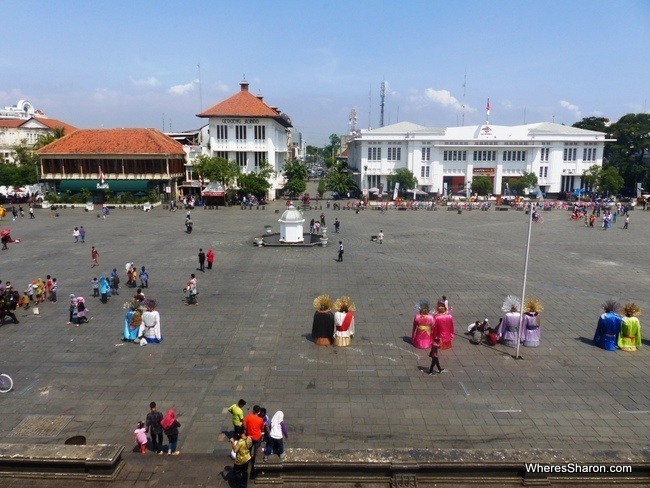 Taman Fatahillah is the old town square from the Dutch capital of Batavia. It’s surrounded by colonial buildings and museums. We were there on the weekend and there were plenty of people which gave it a great atmosphere as well. It is well worth adding it to your Jakarta what to do list. The next three museums lined its sides. 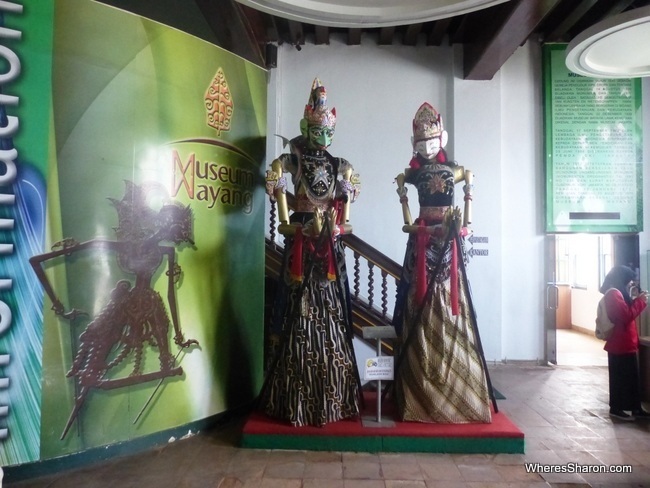 Museum Wayang or the Puppet Museum was a big hit with our kids! It’s two levels of cool looking puppets, each with their own story and background. It all seemed to be taken very seriously. I believe sometimes they have puppet shows on but I am not sure when. The puppets are not just Indonesian but from all around the world. There are lots of different types of puppets and masks. 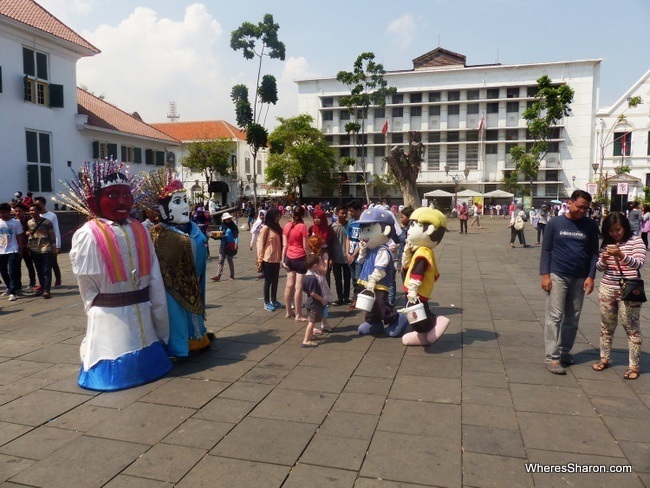 It’s a perfect activity in Jakarta for kids or for people that have a cultural interest. Entry was 5000 rupiah for each adult, our kids were free. 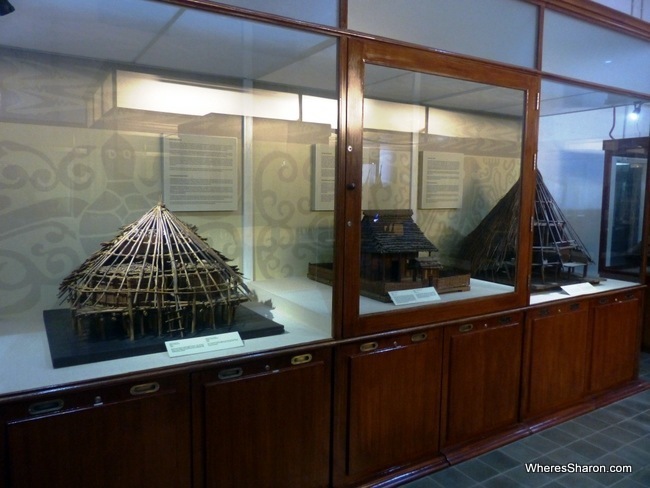 Another of the popular attractions in Jakarta is this history museum. The best part about it is probably its old city hall location in the main square. There are two levels and the first level does have some interesting boards that describe some of the history of the area in English. Unfortunately, not all signs are in English. There are also some old stones with carvings and footprints that were interesting. Upstairs, is some old furniture that wasn’t worth the effort of walking up the stairs but there are some nice views of the square. 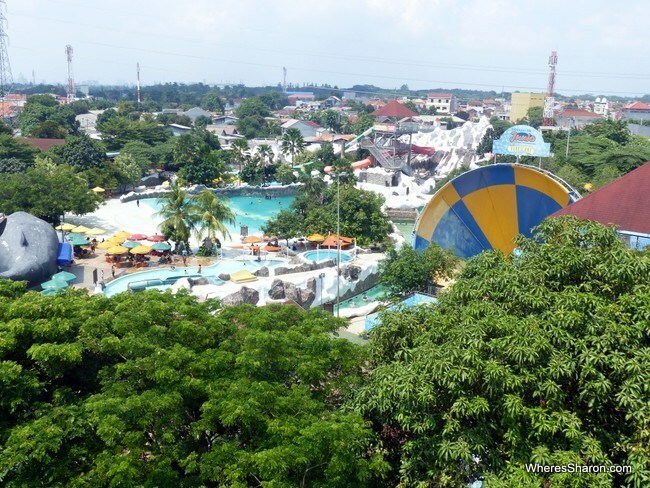 Admission is cheap – 3,750 rupiah per adult, 2,500 rupiah per child. The former palace of justice is home to the museum with contemporary Indonesian art and ceramics. I must confess that we didn’t go inside but it is conveniently located on the main square so it is easy to pop in for a visit. 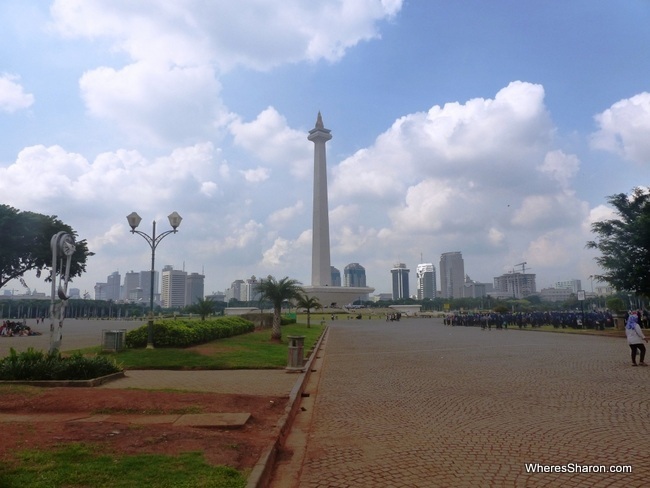 In the middle of Jakarta is the Lapangan Merdeka (Freedom Square) a massive green space with the National Monument (Monumen Nasional in Indonesian or Monas for short) in its centre. It is definitely one of the best places to visit in Jakarta which means it is busy. This giant 132 metre column was the brainchild of Indonesia’s first president Soekarno. After multiple design contests a design was selected and work began in 1961, with the monument being completed and open for the public in 1975. 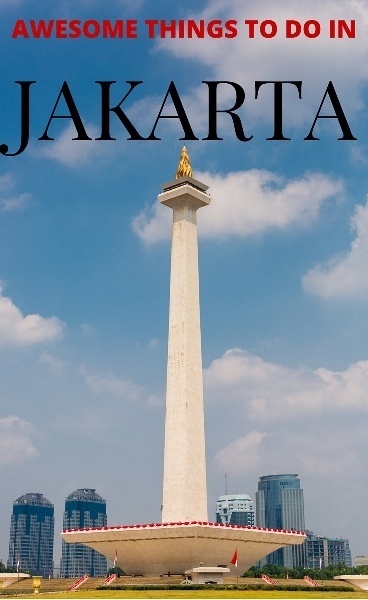 The monument was intended as a symbol of Indonesia’s independence and strength and the column is topped with a 17 metre high flame gilded with gold. 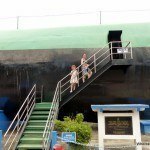 You can go to the top of the monument for 10,000 rupiah for adults, a bit less for kids. Unfortunately, we had to give this a miss as there was a 3 hour wait time! We went on a Sunday morning so I recommend trying early on a week day. We caught a taxi here which dropped us off by Lapangan Merdeka but nowhere near the entrance. It was a long, hot walk. Ensure you are at the gate that is open before hopping out of a cab! 10,000 Rupiah for adults to go to the top. About half as much to go in the base. The National History Museum is located in the base of the National Monument. You can visit here on the same ticket to visit the top or you can just buy a ticket to this museum for about half the price. 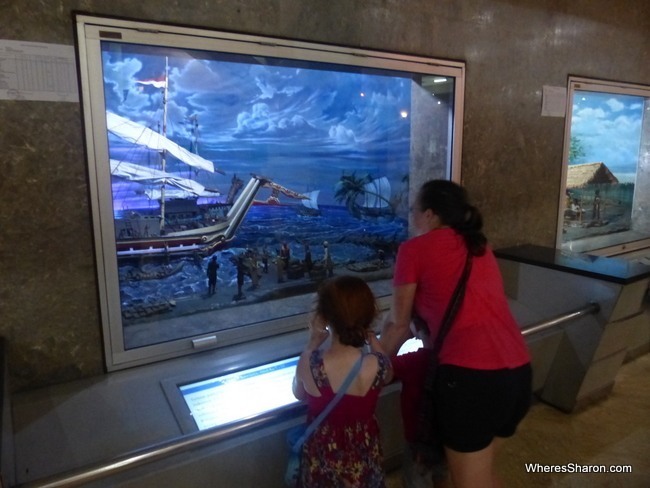 The National History Museum consists of 48 dioramas detailing Indonesia’s history with a particular emphasis on their struggle for independence. There are labels in both Indonesian and English and we enjoyed walking around looking at them all. I was particularly impressed how much Miss 5 got into it and learned. However, I studied some of Indonesia’s history at university and I found some of the facts to have been a bit blurred. Still, we found it a must see in Jakarta, particularly because of its location. 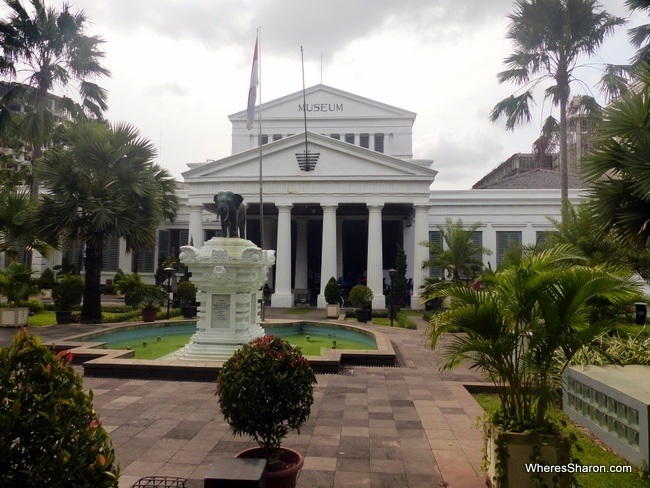 Nearby to the National Monument is one of our top picks of places to go in Jakarta – the National Museum. Displaying a collection built up under the Dutch since the 1780s there are two buildings, a smaller one with the ethnographic collection and a larger one with groups of things like golden artifacts, technology, ceramics and the usual stuff in museums. The newer building is large (with four levels of exhibits) most of which is captioned in both Bahasa and English. It’s well organised and explained and while being interesting it was a bit eclectic for me. The best bit of the museum and the thing I really enjoyed going to see was the Ethnographic section. Usually ethnographic stuff is of little interest but this building has a great collection of statues, artifacts and models that do a great job of exploring Indonesia’s major ethnic groups, showing their differences and similarities. It was surprisingly engrossing and very well done. For kids there is a “Kid’s Corner” on the lower ground floor of the larger building with lots of hands on things based on the exhibits upstairs. It was closed when we visited so it isn’t always open if the museum is. Otherwise there’s lots to look at and the exhibit halls are generally roomy and not very quiet (even on weekends there were noisy school groups) and little kids won’t stick out. Strollers won’t be an issue either. 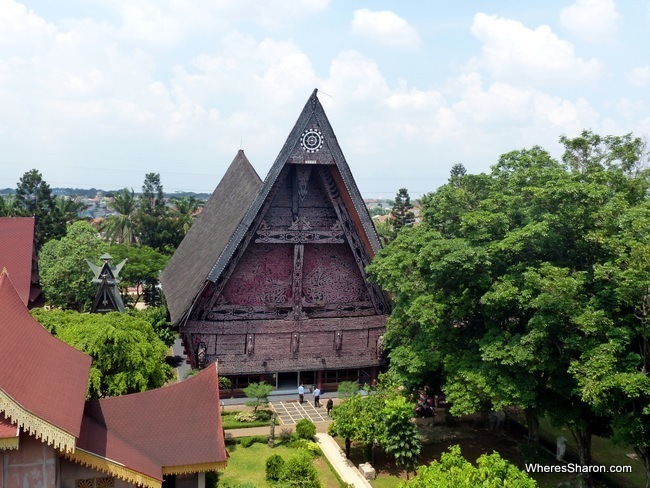 If you’re at all curious about the different peoples of Indonesia then this is a great place to visit, however even if you’re not, this museum is still one of the top things to see in Jakarta and has a couple of hours worth of exploring in it for young and old. Entry is 10,000 rupiah for foreigners and 2,000 rupiah for kids. Taman Impian Jaya Ancol is a huge waterfront area full of amusement parks, eateries and other fun places to see in Jakarta. There is even Indonesia’s version of Disneyland with Dunia Fantasi. There are also many other parks including a water park. You can read about the main ones here. It covers a big area and things are quite spread out so you need transport to get around and between the attractions – we did not have any problems finding taxis. It costs 25,000 per person (including kids) to enter the Ancol area. This is on top of tickets to the individual Jakarta attractions. 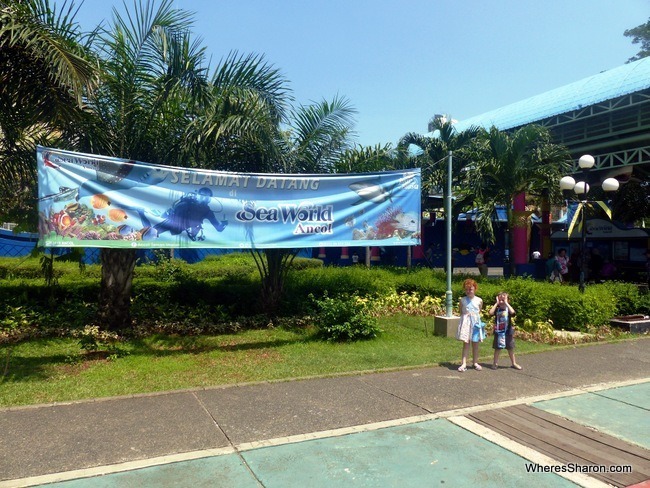 Seaworld is a great aquarium at Taman Impian Jaya Ancol. We have often been disappointed by aquariums but this one is very good and we all enjoyed it. There are many different types of sea life including sharks, a dugong, turtles, sea otters, sting rays and eels. On display is an animal I had never heard of – a whipray which is the largest species of stingrays and can weigh up to 450kg! The highlight is an 80 metre long tunnel and the touch tanks. The kids liked being able to touch some of the animals although they weren’t daring enough to pat a shark. 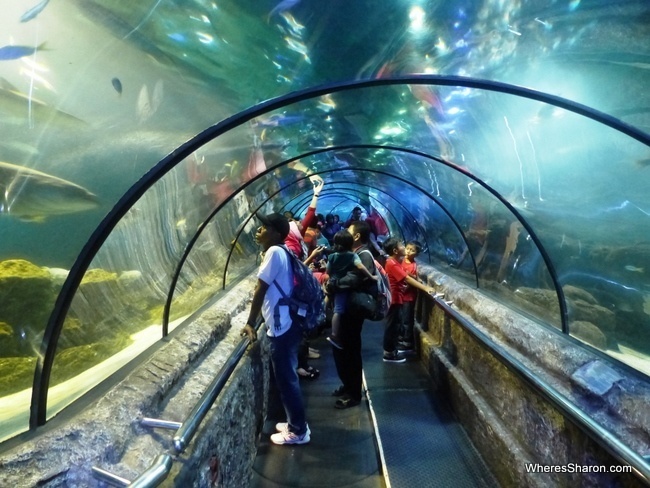 If you are travelling with kids or like aquariums then this is definitely one of the best things to do in Jakarta. Entry is 100,000 rupiah per person (including kids) and there is a food court area as well as a shop at the entrance to the aquarium. One of the tradition houses from the cable car – very impressive! This massive 100 hectare area of Jakarta is described as a “culture-based recreational area” and I don’t know a better way to put it. I have not been to anywhere quite like it. It is full of attractions that are worth adding to your what to see in Jakarta list. There are a wide range of attractions here. The base attraction is that there are areas that represent most Indonesian provinces. There are supposed to be traditional houses in each area, although it did not seem to be that way to us. In fact, it was a bit confusing what exactly there was to see in some of the areas. Thankfully others were very well done and it was fun to walk around and have a look. Many of the provinces had huge, quite spectacular looking traditional houses. On top of this, there are many, many museums and other attractions like a water park and bird park. The big site is actually packed full. There is also a row of different religious buildings – like a mosque, catholic church and a Hindu temple. There are also cable cars, a monorail and train. Some of the museums look incredibly impressive – like the massive soldier museum. There is also a very cool looking Komodo Dragon Museum and Reptile Park. The building which houses it looks like a giant komodo dragon (unfortunately, shut while we were there). 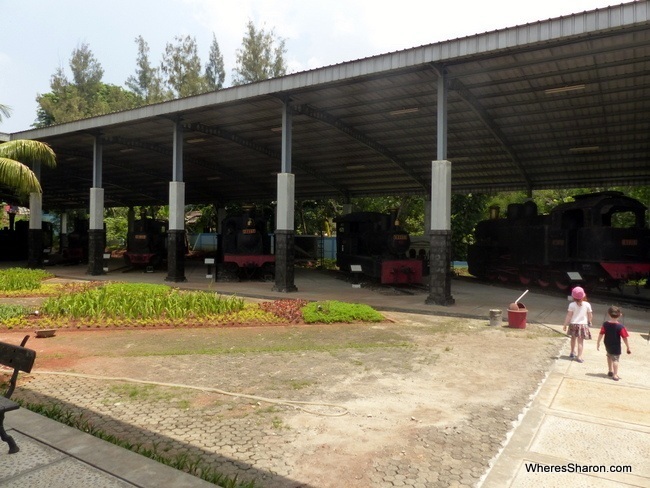 The Transport Museum is especially cool if you are looking for things to do in Jakarta with kids. There are many trains, as well as whole Garuda airplane, other planes, a helicopter, old buses, taxis – a whole lot of stuff. Our son was in heaven! 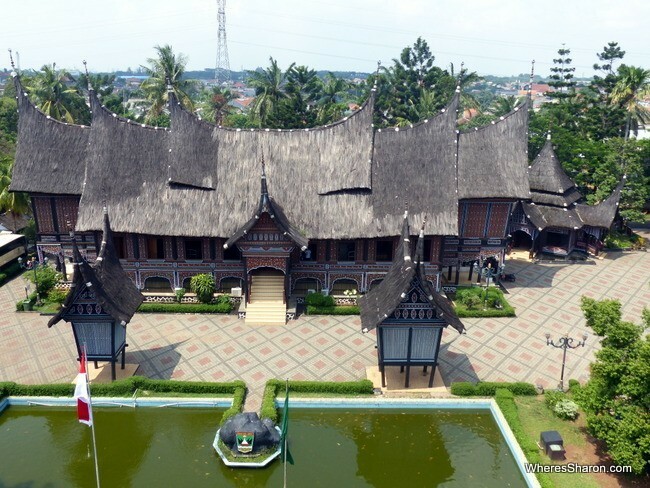 There is so much to like about Taman Mini Indonesia Indah. There are so many places I wanted to explore here. However, that was also its downfall for us. There is just so much and over such a big area and we weren’t able to find much helpful information either before we went or when we got there. All we could get was a photocopied map that was missing some details. The site is huge and hot and we had to walk a fair way before hitting anything that was very interesting. Honestly it was a bit frustrating. There are transport options but the prices we heard were not cheap and when you don’t really know where to go, it can seem easier to just walk between places. We went on a week day specifically to avoid the crowds I read visited on weekends. I actually think this was a mistake. I think it would have been easier to work out where to go and what to do in Jakarta’s Taman Mini Indonesia Indah if more people were around. Often we would go to one of the province areas and not be sure if there was anything we were supposed to look at as it just looked like a shop and offices. It would have been good to follow crowds and then I imagine the transport around the site might have ran more often and been more useful. Many things also seemed to be shut. My tip would be to make a list of the places you want visit within the park and just try to hit those and use transport between them. To do this, you either need to hire a bike or get lifts on motorcycle taxis. If you are pregnant with young kids like me (no way I was doing those options), I’d be looking into hiring a taxi or driver while there. It’s just too hot and the area too big to keep walking around. Writing a list can be tricky as its hard to know what’s good. It could be worth going on the cable car at the beginning which has great views and can give you a better idea of what appeals. The provinces that had pavilions listed in the first half of the alphabet on the map looked better to us than the ones we visited in the second half. It may also be worth taking your swimming costumes. The Snow Bay water park looked very good to us when we saw it from the cable car on our way out of the park. It would have been a great way to cool down after all the exploring. Snow Bay Water Park looked good! In an ideal world, you definitely want to spend more than one day here. There is just too much for such a short time period, and I am sure I could write a guide to the top 10 places to visit in Jakarta just using attractions in this park! Z gets his car fuelled up at the petrol station. Given Jakarta has its own branch of Kidzania we had no choice but to go. If you’ve no idea what Kidzania is then see our review of the Bangkok edition. 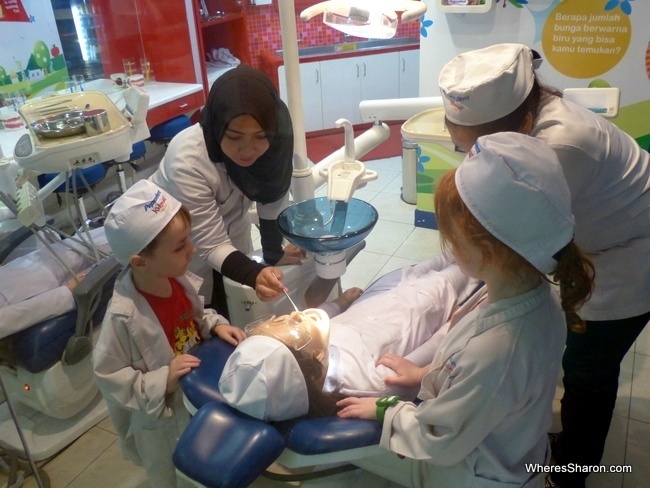 In a nutshell Kidzania is like a massive indoor play centre where the activities are based on the kids doing jobs such as being a firefighter, police or dentist (and a whole lot more). The activities are educational and very detailed. Firefighters don protective gear and go and put out a simulated fire with real water jets. Dentists examine patients in a miniature dentist’s surgery with real dentists chairs that go up and down.Kids earn money (kidzos) for doing a job which can be spent elsewhere. There’s a few differences between Jakarta and the Kidzanias in Kuala Lumpur and Bangkok. The first is that those activities where the kids cook their food can’t be paid for with kidzos but need rupiah. Secondly, there’s no shop to spend kidzos in which can make it hard for kids to spend their hard earned money. 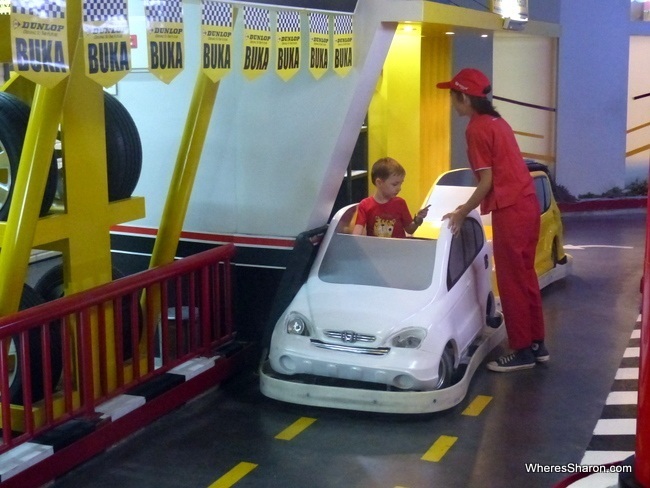 Jakarta Kidzania is also smaller than the other two but is still quite big has plenty of things to do. 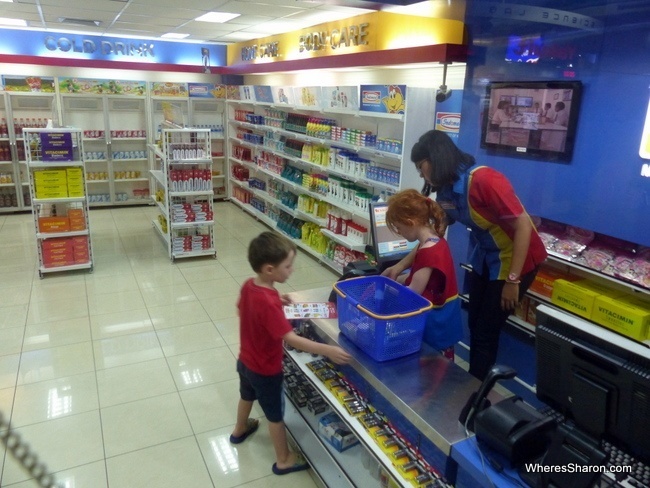 Z is a customer and S a cashier at Kidzania’s convenience store, a miniture Indomart. One nice thing addition we hadn’t found in other Kidzanias is the addition of taxis and buses. Kids could ring for taxis or go to the bus stop to have a ride around the centre. 3 year old Z especially loved going for rides. It’s hard not to like Kidzania and the Jakarta branch is as well executed as the others with fantastic attention to detail. If you’re in Jakarta and have yet to experience Kidzania then a trip here is sure to be worth it. It’s our pick for the best place to visit in Jakarta with kids. Kids over 4 are 250,000 rupiah, adults are 200,000. Kidzania is located on the 6th floor of the Pacific Place Mall in South Jakarta. Digging in at the Snow Playground. We were lucky in the timing of our visit to Jakarta. We were able to catch the annual Winter Wonderland at the Pondok Indah Mall 2 perhaps the “coolest” tourist attraction in Jakarta. 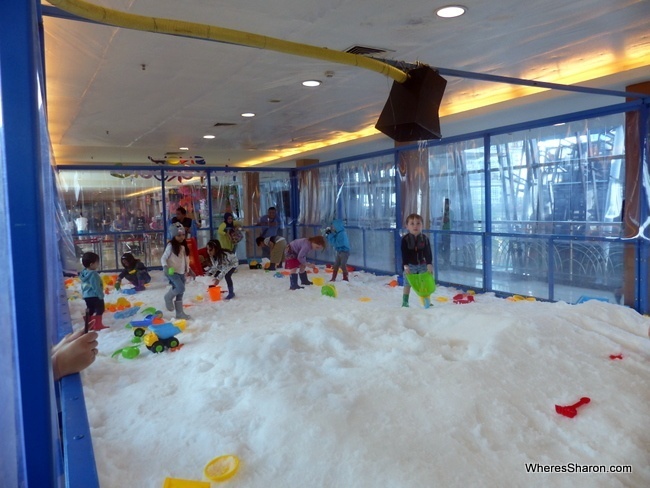 Although its never winter in Jakarta, the mall has some classic winter activities on offer. Under the main atrium is a temporary skating ring. On the second floor of the north skywalk is a snow playground. Entry includes skates or gumboots. S and Z tried out the snow playground and had a great time. The snow was artificial (it was loose, granular ice rather than nice powder) but with lots of spades, buckets and other toys no one cared. Luckily for me sessions were restricted to 30 minutes else I’d never have gotten the kids out. It was a lot of fun and S and Z loved it. Entry to the skating rink was 130,000 rupiah on Fridays, Saturdays and Sundays, cheaper on the other days. The Snow Playground was 80,000 rupiah on Friday to Sunday and half that on the other days. As you’d expect in a big city, there are many choices of accommodation in Jakarta. The main thing we kept in mind was location, location, location. Jakarta is a big city with traffic problems so I’d recommend trying to minimise the time it takes to get places. Of course, the Jakarta attractions are spread out. I put where we wanted to go on Google Maps and then made sure I found a hotel in the middle of it – this was how I found the Lumire Hotel. Lumire Hotel is a great choice. It is in the middle of things, not far from the National Monument. Another big plus for us is that it is right next door to a big shopping centre which made eating out super easy. The hotel is a big, international standard 4 star hotel with many room types and a range of facilities. We booked the cheapest room – a superior – and were later upgraded to an executive room after there was a problem with the toilet in our room. We were very impressed how quickly they handled our problem and the fact they went out of their way to make it up to us. Both rooms were very similar, there was just a bit more space in the executive. We had king size beds in both, a lounge chair big enough for one of our kids to sleep on, plenty of storage space, a bar fridge, desk, cable TV, good wifi internet and toiletries. We were very happy with both room types. The executive room also came with included minibar, fruit and access to an executive floor with a nice area to hang out, drinks and nibbles. The hotel has all the facilities you would expect from a 4 star hotel – a decent sized pool (although not really suitable for kids), fitness centre and restaurants. We had room service a couple of times which was good. The breakfast buffet did not have many options that appealed to us. All in all, we were very happy with this hotel, it met our needs perfectly and is good value. Millennium Hotel Sirih Jakarta – This hotel offers a central location and affordable deluxe family rooms which are perfect for families. The hotel itself has a fitness center, spa and pool. National Monument is only 10 minutes away and a free shuttle to major shopping attractions is offered by the hotel. Click here to see the latest prices. Somerset Berlian Jakarta – Apartments are always a great option for families, and located in Kebayoran Lama these are ideal. In addition to an outdoor pool, fitness center and spa, this hotel offers affordable apartments with 2 – 3 bedrooms. Rooms are clean spacious and modern, and the building has 24 hour reception. Click here to see the latest prices. 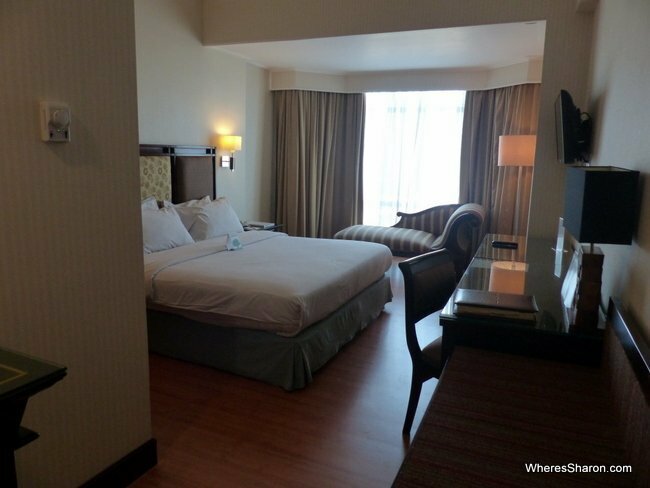 Ascott Kuningan Jakarta – If you’re looking to spend a bit more, staying at Ascott Kuningan is a great experience. These 5 star apartments offer families access to the best of amenities including courts for tennis, basketball and badminton, as well as BBQ equipment. Restaurants and bars are only a 10 minute walk away, and you can choose from 1 – 3 bedrooms to suit your family. Click here to see the latest prices. Aston at Kuningan Suites – Stretching your money as far as it will go, here you’ll find affordable apartments with convenience. Centrally located, the building has a laundry room on every floor, an onsite restaurant and a rooftop pool, and offers 1 – 2 bedroom suites for families. Click here to see the latest prices. 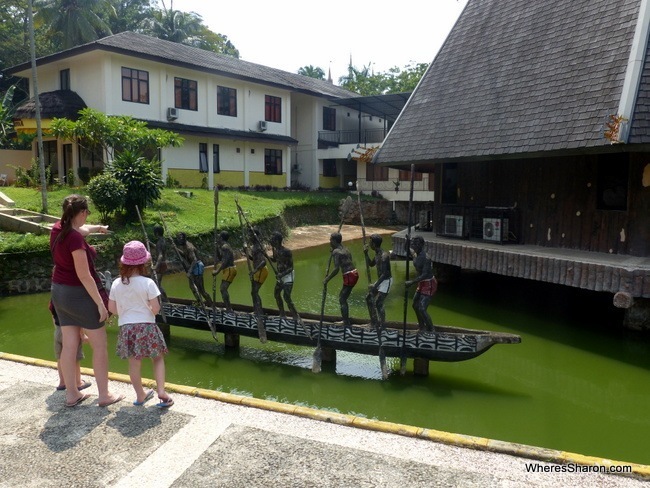 We think Jakarta is an excellent place to travel with kids – and so do our kids! We were in Jakarta with our 3 and 5 year olds and I was also 18 weeks pregnant. 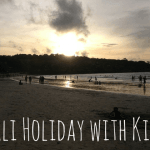 There is a crazy amount of things to do in Jakarta with kids, taxis are cheap and plentiful, there are lots of accommodation and dining options. It’s an easy place to be. Our kids favourites were KidZania, the Winter Wonderland, Museum Wayang, the Transport Museum and Seaworld. I would definitely consider bringing a stroller here for younger kids. Jakarta is a massive hub and has one of the busiest airports in the world so it is not hard to find a flight here! You can easily get to Jakarta from anywhere in SE Asia or Indonesia as well as many other places. From within Indonesia, you can also get a train, bus or boat to Jakarta. We found flying to be about the same cost as going overland so we went the flight option, as much as I would have liked to try the train. 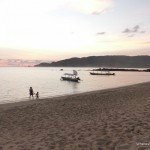 9 hours versus 1 is a no brainer when travelling with young kids and pregnancy though! The easiest way to get around Jakarta is via taxi and that is what we did. They are plentiful. Every single one we hopped in used the metre without asking and took a direct route. It is painful though. The traffic was not as bad as I imagined after hearing how bad it would be so many times – but that is because I imagined grid locked traffic all the time and it is probably only about 1/2 the time! It does take awhile to get anywhere and by the time our five days was up, I was over it! Although after returning back to Melbourne, I have not noticed much of a difference between here and there! There are also buses and rickshaws/tuk tuks. There are trains too but they don’t run many places. The public transport options would have always required changes and given the cheap cost of cabs and the fact there is 4 of us (including 2 preschoolers and 1 pregnant woman), we were very happy to keep to taxis. The cost does add up though as some attractions are far flung and journey times can hit an hour. We spent about AUD$200 a day in Jakarta which I think is a real bargain. About half of this went on our hotel. We also often had a room service dinner, we caught taxis everywhere and we did do some more expensive attractions with KidZania Jakarta and Seaworld. Often kids were the same price as adults which helped admission prices add up too. It was all worth it! We were surprised to find that we really liked Jakarta. We are city slickers so perhaps this isn’t a surprise at all. I was surprised by how pleasant it was. Don’t get me wrong, it’s a big city with a lot of problems. But the problems were not particular visible to me as a tourist. I thought I would see a lot of poverty and I didn’t see any. I thought the people would seem more conservative, they were just smiley and welcoming. My only complaints are the traffic and the fact that it was very hot. I love heat and am very used to it after living in Penang – I found Bangkok a bit chilly at times on one of our visits and same with Bali on this visit, but I found it very hot in Jakarta. Would we come back? Most definitely. 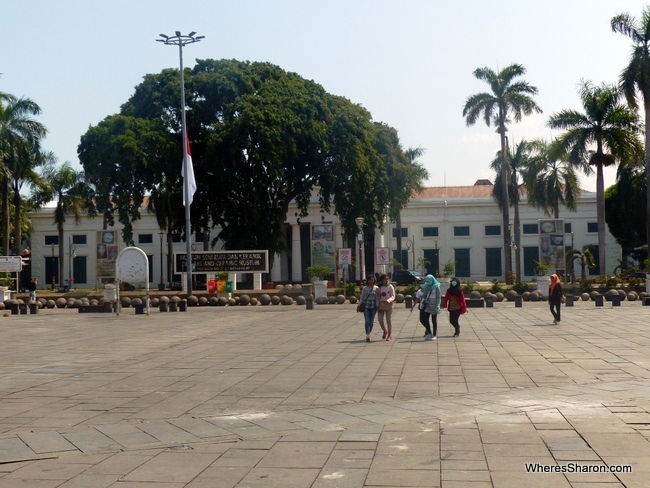 The city intrigues me and it felt very much like we only had a taste of what was on offer, especially at sites like Taman Mini Indonesia Indah. I want to see more! This whole visit to Indonesia has me more keen than ever to explore more of this diverse and fascinating country. You can also read our guides to nearby Surabaya and Bali and don’t forget to check out all our other Indonesian travel guides. Have you been to Jakarta? Would you like to go? Please note: I wrote the majority of this article as we were leaving Jakarta in January – right before the latest bombing in Jakarta. Disclaimer: This article contains an affiliate link. If you make a booking after clicking on it, we may receive a commission at no extra cost to you. Thanks for supporting our site!! Thank you! It’s so interesting to see some real experiences on Jakarta as they seem so rare! We are definitely going to consider it next time we go to Jakarta now. No problem Sarah!! Enjoy your next trip. Jakarta does seem like fun and your pictures are great. Thank you for sharing this great experience; I will definitely put it on my list for this year! Thank you Sharon for a really detailed and useful post. I have some great ideas for visiting Jakarta I especially like the look of Sea World and the Indonesia Miniature Park it seems like you had a wonderful time. Thanks Dave! We liked Jakarta more than I anticipated. I’ll be in Jakarta in 3 weeks time with two kids and a husband 🙂 Love your post, give me good insight where should I bring them especially when having small kids. Quite worry on the weather though. Hi Naa! I hope you have a great time. I would guess now is a better time to go weather wise than when we did. It was all good but then we love the tropics. Enjoy! Hi Sharon, I must admit that there were tears on my eyes when reading this post. Great that you love Jakarta! I love Jakarta too especially the foods! Have you been to Bandung? It’s only about 3 hours from Jakarta and of course it’s not hot. The Netherlands who invaded Indonesia in past time called the city “Paris van Java”. Just Google it and you’ll see that there are even more green park which suitable for your family, I believe. Thank you Andi 😀 I am glad you enjoyed it. Unfortunately, we have nott been to Bandung – yet! We definitely want to keep going back to see more of Indonesia.